STORM STACEY TAKES HIS FIRST WIN FOR FPW RACING WITH VICTORY AT THRUXTON! 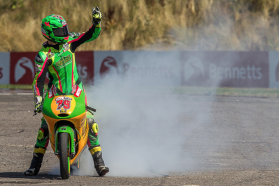 FPW Racing have enjoyed a successful weekend during round five of the HEL Performance British Motostar Championship at the ultra fast Thruxton circuit. Storm Stacey took his first victory since joining Adrian Mason’s team at the start of 2017 and backed this up with a strong fourth place in race two; results that significantly close the gap to the series leader with eight races remaining. Friday’s free practices were held in dry, sunny conditions. Storm completed the morning practice in third position before charging to the top of the time sheets during the afternoon with his final lap of the session. Qualifying took place over a 30 minute period on Saturday morning with six riders in close contention for the front row of the grid. Storm was always in the mix, and would head up row two with a fourth place grid slot for the opening race. The fast, flowing nature of the Thruxton airfield circuit lends itself to close racing and slipstreaming and this was again the case in both races. Storm made a great start and headed the field at the completion of the opening lap. With positions constantly changing in the slipstream the ‘leading pack’ had become seven riders with a couple of laps remaining. On the long run up the hill to the chicane on the final lap, an incident occurred that involved one rider crashing and other riders taking evasive action. Jack Scott came through to take the chequered flag but later received a penalty demoting him one position, resulting in Storm, the leader going into the chicane, taking the win, his first for the team and his first of the season. With lap times from race one deciding the grid for race two, Storm would find himself starting from row three in seventh position for Sunday’s race. After another trademark Storm Stacey start and opening lap, he would be running third and then up into second position by the completion of lap three. For the remaining laps, a group of five riders contested positions second through to sixth with Storm leading the group on several occasions. The race leader held a clear advantage leaving the following group battling for the minor podium positions. Storm was particularly strong on the brakes enabling him to make many overtakes going into the chicane, however, back markers came into play during the last five laps, resulting in the group being separated a little, he battled for second position throughout the race and finished in a close fourth position to round off an enjoyable and competitive weekend for both himself and the team.